When you buy a stick you have several options for the type of ferrule you want on the tip. The ferrule helps to prevent the stick from wearing down or splitting in use and also helps to stop the stick slipping. The Brass ferrule is most commonly fitted - a simple cap made of brass, shaped like a thimble. Cheap but not hard wearing - needs replacing frequently if the stick is used a lot. 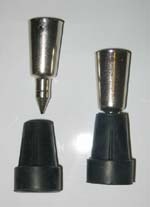 Steel-tipped ferrules are similar to the brass ones, but have a hard-wearing steel plate welded on the base. They normally last several years unless the stick is used very frequently on hard, abrasive surfaces. Alpine Spikes are made of plated iron and dig in to rock and ice. They have specially made (optional) rubber ferrules that fit over the spikes. The spikes are shorter than the sockets in the rubber ferrules to prevent them piercing the base of the rubber. Rubber ferrules are best for use on pavements or indoors. The brass and steel tipped ferrules can be covered with a removable rubber one for your convenience. 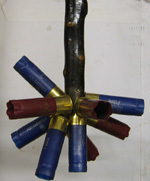 Magnetic ferrules can be fitted to sticks that are taken shooting. You can pick up several empty shotgun cartridges at a time - so avoiding having to bend over or put your hand in nettles or other unwelcome places! ALL OUR FERRULES ARE MEASURED SO THAT THE SIZE GIVEN IS THE SIZE (DIAMETER) OF THE STICK THAT THE FERRULE WILL FIT. How Soon can I get my stick? There is currently a 4 month (minimum) waiting list for carved sticks with bird/animal heads. If you want to order a stick as a present and you've left it too late, why not ask for a STICK VOUCHER instead? You can ask for one when you order by using the "additional information" box on the order form (or e mail me). That way your friend gets TWO presents. The Stick voucher on the special occasion and the anticipation of receiving the actual stick a few weeks later. This is especially important as Christmas approaches. Most sticks will need at least a few weeks notice because we take orders all year round and start making Christmas orders in November. Almost unique to The Stick Man, these screw joints can be fitted so that your stick can be separated into two halves for putting in your suitcase. They can also be fitted so that the head is detachable. You can then buy alternative heads to screw on - useful if you want your stick to reflect what you are hunting or if you change your dog! Having a screw joint fitted adds only £18.00 to the price. Simply tick the check box. Does a screw-joint weaken a stick? In simple terms, yes! By cutting the stick and fitting a joint it obviously causes it to behave differently. Downward pressure - as in normal use for walking - appears to make little difference. Sideways pressure, such as hitting something, swiping down nettles, or leaning on the stick at an angle puts 'unnatural' strains on the joint which can result in the stick around the joint splitting. Putting the stick in the car and piling luggage on it is also very bad - but then you should have unscrewed the parts to make the stick easier to put in the car anyway! We strengthen the joints by winding strong thread around the stick either side of the joint and get almost no breakages (that we hear of). Basically you have to weigh up the options - do you want a stick that is long and difficult to take on a journey - or would the joint make the stick far more 'user friendly' and so outweigh the slight weakness? Other options include a magnetic steel ferrule - useful if you shoot and would like to pick up spent cartridges without having to bend down! The ferrule has a powerful magnet hidden inside and you can pick up to five or six shotgun cartridges at a time - great trick when out with the boys! We have access to photographs of almost every dog breed in the world so all you have to do is to state the breed. However, if your animal has special markings or colour, you can send us photographs or give a link to a web page where you've found an animal similar to your own and we will try to paint the head to match. Photos are normally non-returnable because they may get marked or damaged in our dusty workshop! However, if you need us to return your photographs, please say so. I appreciate it may not be possible, but photographs should preferably include front, sides and rear of head please - all taken from the same level as the dog. Either get down on your knees or put the dog on a box or table to get good pictures. One picture looking down at the top of the head may be useful but if all the photo's are from above it makes it very difficult to work from them. If I have to rely on one or two angles I may not be able to do such a good job. I once received a photo showing two dogs playing in the next field and a circle had been drawn around one with "This one please" written alongside. I could cover both dogs with one thumb - that is asking a bit much! 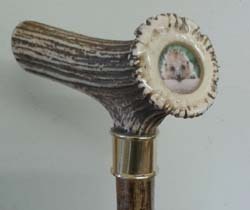 Stick length is important for a walking stick (American "cane") if you need it as a walking aid because you are unsteady on your feet. Short stick (Regency type and any stick used around the height of your hip - not so suitable for thumb sticks or Hikers) - stand up as straight as you can and measure from the floor to the crease of the wrist. This allows the arm to be locked straight when your full weight is applied to the stick. It is best to get help when measuring - if you do it yourself there is a tendency to lower your shoulder as you look down and your stick may then end up too short! Long stick (hiking stick, thumb stick, Wading stick etc.) the measurement should be from the floor to the base of the breastbone. Some sticks can be used long or short - crooks and market sticks, for example. Some sticks only work short e.g. the Regency, others only work long - Thumbsticks do not work well in short lengths because the angle of the fork does not fit the hand that way. Hikers are more often used long, though some people prefer them shorter. If you are buying the stick as a present and don't know the length, simply give the person's approximate height - but make sure you indicate this is the height of the person and not the stick! You can put something like "person 5ft 2 ins tall"
Standard length for any gent's walking stick ("cane") is 36"
Standard length for any lady's walking stick ("cane") is 33"
Standard length for a long stick such as a Thumbstick, Crook, Hiking Stick, Wading stick or carved head is 48" to where it is gripped. If you do not specify a length then I will send 'standard' sizes. We generally cut our own sticks at length of around 56" so anything below that is fine - please enquire by email if you need anything longer. We do cut a few longer ones but to a maximum of around 60" and we only cut a few of these each year. If you are of particularly heavy build or are disabled in a way that may affect the way you hold or use a stick, or if you intend to use the stick for a purpose other than as a walking aid then PLEASE TELL US! It may affect the materials we choose or the way we build the stick. You can email us or simply put a note in the box for telling us the length you require - for example you might put 48" HEAVY or similar. If you don't tell us we can't read minds! The Shopping Cart order form includes a section where you can type additional notes to clarify what you want. Please don't use this to ask a question. It's better to use email and get all questions answered before you place an order! Description: The crystals are a natural water-based wood dye made from walnut husks that have been through a boiling process. Preparation: Keep a record of the amounts you use so you can duplicate the colour in later batches. The crystals will dissolve slowly in cold water if left for several hours but the process can be speeded up by using warm or hot (not boiling) water. I make up a small amount of very dark stain (in a clean jam jar or similar) by putting a couple of teaspoons of crystals in and adding warm water to just cover them. Stir the mixture until all the crystals have dissolved - if you find it too stiff to mix then add more water. You end up with a very dark, almost black liquid. If applied to wood this concentrated mixture will "ebonise" even pale wood and two coats should make the wood appear black. Depending on how much staining you want to do you can leave this as your base mixture and simply add small amounts of it to clean, cold water in another container to get the desired depth of colour. You can also make up several batches of different strength and keep them in separate containers - I have three jars, one with the original "black" concentration, one diluted to a dark brown and a third diluted to a pale brown. These mixtures have been in the jars for several years without any deterioration! Application: Use a brush, sponge or spray to apply thin coats of the COLD mixture to the wood. Allow to dry for at least 20 minutes before lightly sanding and applying another coat if required. Leave for at least four hours before using shellac, oil or varnish to seal the stain in. Timings may be speeded up by drying the wood with warm air from a hairdryer or heat gun - but don't scorch it! CAUTION: 1) Keep out of the reach of children! 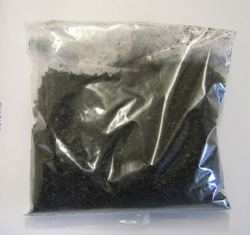 2) Test on a small area first and allow longer drying times in cold, damp conditions. 3) Use in a well ventilated area. 4) Van Dyke crystals should keep at temps above 4 degrees C for at least 5 years. 5) Wear suitable gloves and eye/face protection. In case of contact with eyes rinse immediately with plenty of water and seek medical advice. Rinse off hands and skin immediately with water. I frequently get asked about the "best" way to get a good shine on horn. True horn - from sheep, goats, cattle, buffalo etc. is made of the same material as our fingernails. Antler, on the other hand, is made of bone. For the purposes of polishing they can all be treated in a similar fashion. First of all, the outer surface must be removed to get rid of any dirt and flaky or cracked material. The "horn" just below the surface layer is much more solid and will polish up when treated properly. To begin with you can use a rasp or file with fairly fine teeth - anything really coarse will leave deep scratches that are difficult to remove. A simple "engineers" file will do the job, as will abrasive tape/cloth of around 100 or 120 grit. Again, anything coarser will leave scratches that take a lot of removing. Once the surface has been removed I use a new "Stanley" type blade as a scraper, held firmly between finger and thumb of both hands (if possible - meaning you need to hold the horn or the stick in a vice). You can use one hand but you don't get as much pressure on the blade. Hold the blade so it is almost at a right angle to the horn and scrape back towards you. Each stroke removes a thin slice of horn but doesn't leave deep scratches. Progress with finer abrasive - say 180 then 320 grit, each time removing ALL scratches from the previous stage - if you leave some in you will struggle to get them out later! Finally use fine (0000 grade) steel wool to get a satin sheen and then "Peek" metal polish or buffing wheels and compounds to get a high gloss. With antler you don't need to take off all the surface - just enough so some of the white bone shows through the brown peat staining. The more white that shows, the more glossy will be the finish. Clean the outside of the horns as above. The hollow inside of the horns must be cleaned with fine Abranet or steel wool and then a bottle brush can be used to clean out any debris you've left. Sterilise the inside by filling with a solution of baby bottle sterilising fluid, or drop a couple of "Sterident" tablets in and fill with water. Leave the solution in for several hours, preferably overnight, before washing out with clean water. DO NOT use strong bleach solution as it can dissolve the horn!!! After using the sterilising fluid, full the horns with cheap beer or wine and allow to stand overnight again. This will remove any tainting flavour left from the sterilising fluid and make your drinks more palatable when you use the horns for the first time! Where does the antler come from and is it naturally shed? All my antlers come from the Scottish Highlands. From February until about November they tend to be naturally shed antlers that are picked up on the hills by farmers etc. After October they are usually from the annual cull of weak and injured stags that would not make it through the bitter winters in the mountains of Scotland. It would be really cruel to leave these sick and injured stags to starve and freeze to death and it is a legal requirement of the landowners to carry out a cull to prevent this. Only fit and healthy animals are left to face the harsh winters. People often ask why they can't be kept in for the winter - but they are entirely wild and can not be herded like domesticated animals. In any case - wild deer would fight and have no place to run away if kept confined in buildings so would injure and probably kill each other! I have absolutely no ethical problem with selling both shed and culled antlers but if it bothers you then there are other sellers. Just beware though - I know for certain that some of them lie about the origin just so they can sell them - I prefer to be honest and let you make up your own mind! Fixing Plastic sheet for use with coins, badges, pictures etc. You can easily cut the plastic sheet with a small saw - a Coping Saw is ideal - then filing it to the exact size you need. It's best held firmly in a vice while cutting but don't squeeze up too tight or you can crack it! Leave the protective covering on until you are really ready to fit it. I tend to use clear epoxy or one of the Milliput epoxy putties - white in antler or black in buffalo horn. If you're using the plastic in wood then you can mix clear epoxy with some wood dust of the same colour as your background wood to make a paste. Push the plastic into the cavity with the picture/badge/coin or whatever underneath then fill the gap around the edge with your putty or liquid epoxy. If you are going to sand the plastic down then overfill the gap so when it sets you can file or sand it down to get a perfect seal. If you use the clear epoxy on its own it tends to be a bit runny sometimes and can go under the plastic and spoil the surface underneath so just be aware of this - on top it doesn't matter as you can sand it back and polish it anyway. Alternatively, you can use a tissue dipped in Methylated Spirit to wipe away any epoxy while it is still liquid. If you use Milliput you can wipe excess away with a tissue dipped in water! I would strongly advise against using super glue unless you have the thick formula that doesn't run - again, the runny variety can run under the plastic sheet and spoil it. I've done all these things so know what to avoid! You can either set the plastic at the level you need or leave it slightly proud and cut it back with a file and or sanding tape/mesh. If you do the latter you will need to use finer grades of abrasive then polish to a clear shine again with metal polish or buffing wheels. Here's one I've made, the plastic was set slightly lower than the surrounding antler so I ground the antler down to the level of the plastic, rather than sanding the plastic down to the antler. As long as it works - who cares? I use an office laminating machine to cover any photo's first to help prevent glue from spoiling the image by soaking in to it. 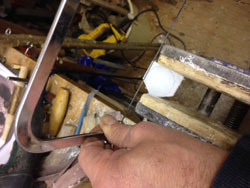 A collar can either be built in between the handle and the shank at the time of making - or it can be slid up from the base of the shank and made to rest at the joint. Obviously, the base of the stick MUST be thin enough to allow the collar to pass over it and in the case of natural thumbsticks the base is thicker than the top - so it's impossible to do! In the case of a knotty or knobbly shank then the same thing applies - if the collar won't slide over them it can't be fitted above them. In these cases it might be possible to fit an engraved silver disc with a name or date or short message instead of using a collar. Knives, rasps and abrasives. A collar or spacer to fit at the joint. A wrist strap. All of the avove can be found on this website - use the list down the left side of each page to take you to the correct page. Remember - if you're not sure what sizes to order then some of the items have a way to select things to fit shank or shanks you are ordering. If in any doubt you can also use the text box for Technical instructions on the order form (it appears after you add your first item to the shopping cart) asking us to make sure items can fit!